Finding My Writing Tribe - Spectacular Fiction! In one section of the book, Jeff mentions an aha moment he had when he realized that he was not necessarily the best writer in the world. While this realization may seem disappointing, he also understood that he didn’t need to be a perfect writer to be successful. As a recovering perfectionist, this point really hit home for me. It’s all too easy to get caught in the negative feedback loop of editing your work and feel afraid to release it out into the world because you think it might not be good enough. And if you’re not careful, that little voice in the back of your mind that tells you “You Can’t” will grow louder than the one that tells you that “You Can.” I am not a perfect writer. And that is okay. What I can do is continue to push and improve my craft to the utmost of my abilities. Writing is a never-ending journey that I’m thrilled to have the chance to pursue. As a former perfectionist, another aspect of writing that I have come to accept is the fact that I cannot please everyone. Jeff explains the difference between helpful criticism and unhelpful commentary from “haters.” It’s easy to feel hurt when someone dismisses something that you’ve spent months or even years pouring energy into, but these are not the people that you should be focusing on. Sometimes even the harshest “haters” will have genuine points to make that you can use to improve your writing – or not, since for better or for worse, using criticism is at your own discretion. Instead of taking criticism as an attack on my character, I need to remind myself that criticism is a helpful way to improve my craft. When times get tough and the right words are hard to come by, sometimes I need to stop and remember why I began to pursue writing in the first place. What make me pick up a pen and paper all those years ago? It wasn’t to please anyone else or out of a hope for fame and fortune. I started writing out of a genuine love for telling stories. I need to remind myself that one rejection or period of difficulty getting my thoughts onto paper isn’t worth giving up on my passion. Even if I have some trepidation about what might happen once I release my stories into the world, fear is not an acceptable reason to hold off on pursuing my dream. Overall, I found Goins’ book to be exactly what I needed to read at this stage in my writing journey. I would highly recommend it to others as a refresher if you’re ever feeling frustrated about the writing process. I’d love to hear your thoughts on how a recent read has affected your perspective on any writing challenges you’ve been facing lately. I am Janice from MostlyBlogging. Thank you for your visit to my site today (still Friday here). I am glad you liked my post about the Sticky Blogging technique. To respond to your post: I am familiar with Jeff Goins, a fan even. 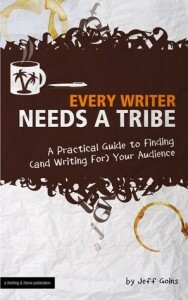 I agree we need tribes.f However, when I was on Triberr, I found it confusing and haven’t pursued it. 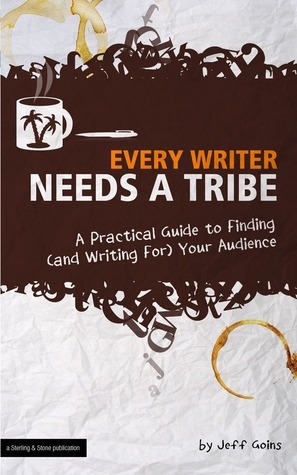 On my site, I have four communities within the blog if people want to find tribes that way. Nice to meet you. Hi Janice! Thanks for visiting my blog. I had actually never used Triberr before and had only heard it in passing previously. Like you, I found it a bit confusing and I’ve heard mixed reviews from others. For now, I think I’ll probably stick to making new friends via blog comments and groups on Goodreads!